Not long ago, a woman approached Ross Danielson at a horse show. "I"m so tired of you professionals coming in and showing as amateurs!" she complained. When he could find his voice, the astonished Danielson protested that he was an amateur -- through and through. But it really shouldn't have been a surprise that some people might be confused. His meteoric success in handling halter horses could give that impression. 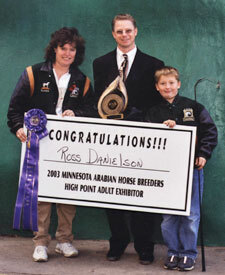 Ross Danielson's first trip to the U.S. Nationals with a contender in Amateur Halter Mares came in 1999, and resulted in the championship. He followed it up with another win the next year and the Canadian title in 2003. Along the way, each year was punctuated with a National Top Ten or two. As impressive as Ross Danielson's amateur halter career has been, however, it has not been the most important aspect of Danielson Arabians in Buffalo, Minn. What stands out most to Ross and his wife, Terri -- and the operation is definitely a family affair -- is that they have slowly but surely moved into breeding their own champions. "Their two main goals," says Jerry Schall of Shada Arabian Sanction, where the Danielsons have maintained their show horses for nearly 20 years, "are the showing of National mares and the raising and breeding of National-level foals to put in the marketplace." He goes even further when describing the ultimate goal that he sees for the Danielsons: They want to raise horses capable of putting them in a category with breeders such as Varian or Gainey. And based on the foresight and dedication they"ve put in so far, Schall doesn"t see that as an outlandish ambition. Ross and Terri Danielson's breeding program, and the farm which supports it, are a unique blend of clear eyed business sense and radical, romantic love of the horses. Both grew up with horses, and the synergy of their childhood experiences played an integral role in the approach they took to creating Danielson Arabians in 1990. They managed to avoid many of the mistakes and pitfalls common to fledgling horse operations, and the horses they are breeding now are not only attractive individuals, but ones whose pedigrees are demonstrating depth and reliability. Terri Danielson, a soft-spoken woman Jerry Schall calls "quiet and reserved, but the most quality and loving person in the world," dates her equine involvement to 1976, when neighbors introduced her to Paints. "The love of horses bit me," she says ruefully. She was very competitive, she recalls, always wanting to be the best at what she did, and that included showing horses. That year, the highly talented Lynn Simons called, offering to show Red Tom Tom at the Paint Nationals. "I never dreamed that someone would call me like that," Terri says candidly. The experience catapulted her into the "big picture" of horse showing. By the time the gelding had gone to the Paint Horse Congress too (something she"d never heard of at the time), he was the High Point All Around Halter Horse. "Then it was like, 'Okay, I think I can get into this,'" she grins. She was invited to go to Lynn and Andrea Simons Paint Horses in Aubrey, Texas, to learn to show, and subsequently spent a year on the road, going from event to event. Her exposure to the highest level of showing in her breed culminated with Tom Tom being named first in the nation in both open and amateur halter. 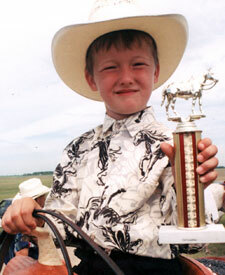 "I showed Tom Tom in amateur and Mr. Lynn Simons showed him in open halter," she recalls. "That was a year to remember. The Simons farm had the number one halter stallion, number one halter mare, and the number one gelding in the nation, along with the number one youth." Later on in Arabians, when she and Ross set their sights on the Nationals, she knew what it would take to get there, and they did not underestimate the amount of work necessary to follow their dream. Ross, meanwhile, was falling in love with Arabians, following the time-honored tradition of buying a Half Arabian first. As outgoing as his wife is reticent, Ross had spent his early years riding a succession of ponies in local competition before he became entranced with the Arabians of a neighbor named Margaret Perry. 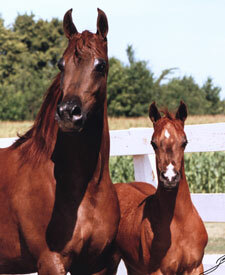 Perry owned an early National Champion Half-Arabian mare Little Miss Heidi. "I bought a three-quarter Arabian mare out of Little Miss Heidi," he recalls. "I worked so hard to get her. I wanted to breed her, and Margaret told me that the horse to breed to would be Garis." It was 1980, and Ross was a sophomore in high school. But he was already exhibiting the willingness to work for what he wanted that marked him for success. Perry was impressed enough to call up Don and Shorty Boggs, who stood Garis. "I'm sending somebody up," she endorsed the young horseman. Ross duly arrived at the Boggs farm in Rogers, Minn., unloaded his mare, and after a little conversation, was surprised to be offered a job by Don Boggs. He remained on the payroll for the next two years, soaking up knowledge and forming relationships that would last for years to come. "You take Ross and give him a lesson," Don would say to his sons. "You teach him how to train some of these horses." Ross smiles at the memory and its long-term implications. "Like Don says, 'Once this horse thing gets in your system, there ain't no getting it out.'" Danielson Arabians shifted into high gear when Ross and Terri, who had met in high school, scheduled a wedding for 1990. Having developed quite an affection for her husband's breed of choice, Terri sold her Paints, and they focused on Arabians. She already had very definite standards; the emphasis was on quality, not quantity. And they both knew better than to expect instant gratification. Their formula? "You looked at the mares, you knew their backgrounds," she says. "You breed only your best mares, and you know that every year you're not going to hit --you might get a dud in there. You keep in mind that it costs just as much to feed a mediocre horse as it does to feed a good one. 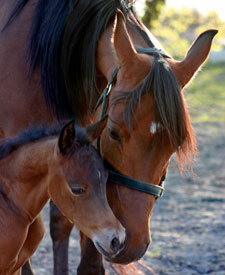 For the longest time, we bred just two mares and there were years that we didn't breed anything." "I critique my horses in what their positives are and their negatives," Ross concurs, "and say, 'this is what I know about my horses; these are the good things that come through, and these are the things that need to be corrected.' In doing that, you need to select a stallion that you think can help you and move you to that next level. You don't just breed because they'll reproduce." Over the years, their herd gained in stature. "You have your Class B horses and your Class A horses, and now we're breeding for the Nationals," Terri continues. "My thought is that if you can't breed them and show them to get them to that level, you shouldn't be doing it. That's what I'm trying to do with my mares." They began conservatively. One of their foundation mares was a 1988 purchase named Coppertique, a chestnut with an unusual combination of old domestic and Crabbet bloodlines. Coppertique produced five foals for the Danielsons, all of whom have been successful; TRShesGotTheLook and TR Copper Ali were both named Region X Champion Mare AAOTH. But the favorite by far has been TR Copperclassique, known around home as "Dilly," or the "Dilly Filly," a Canadian National Top Ten Futurity Fillies. The other foundation mare was Something Famous, by Fame VF and out of Magic Moment, by SX Saladin. Something Famous has given them three foals, among them Ladeena's Glory, by Laddinns Fire, reserve in the Minnesota Breeders Auction Class and Reserve Champion at the Fall Fest as a 2-year-old. Something Famous' most important role at the farm now, however, is as Jonathan Danielson's partner in western pleasure and walk/trot. "She is the last horse we would ever sell," Terri says succinctly. The broodmare band at Danielson Arabians now numbers five, the later additions reflecting their national success in the show ring. There is Kourisma, Ross' second National Champion Mare AAOTH, and TR Copperclassique. There is TR Psatin Kkisses, a daughter of their first national champion, RGR Kkissandra, who sadly was lost to colic in 2000. And there is CJ Psymphony, a Top Ten at the U.S. and Canadian Nationals in open competition and Top Ten in the Canadian amateur arena. Bred to Odyssey SC, she became the dam of TR Concerto, judged Top Ten among Yearling Futurity Fillies at Scottsdale last February. And finally, there is HC Magnifico Miss, purchased after her 2002 Reserve National Championship in Senior Mares with Jeff Schall. This year, she will be Ross' partner in the amateur arena and Jerry Schall's in the senior mare division. "I'll admit that along the way, we have spent some good money on some horses," concedes Terri, thinking of their system of buying a good show horse, qualifying her with titles, and then breeding her. She has no regrets. "What we've got are now producing some very good babies. If I don't believe in my own breeding program, it's hard to sell other people on it." One of the hallmarks of Danielson Arabians has been the use of mares who have made their marks in the show ring. Part of that has been because winning has provided an objective standard of critiquing their horses. The other part is that Ross loves showing. A herniated disc keeps Terri out of the saddle now, but both Danielsons understand the pleasure that can come from competition. And, of course, the success certainly calls attention to what they are doing. As far back as the 1980s, even before he and Terri conceived of Danielson Arabians on the level it is today, Ross was working with Jerry and Jeff Schall to perfect his halter technique -- more accurately, in the beginning, to learn to show halter horses, from the basics up. "He started as a novice and learned to show and present Arabian horses," Jerry Schall remembers. "It took him many years, and initially he had to go in the ring with a bunch of horses that were very hard to show -- and he had to learn to show them. Every day and at every show, he had to strive to do better and better." Ross' commitment has been clear. "He was always the first one here for lessons, and he always took the most lessons of any of my amateur handlers," Jerry says. "He doesn't go in the ring until he knows that he's ready, and then he does an excellent job and presents a beautiful horse." "Jerry worked with Ross," Terri recalls. "He was fine-tuning Ross; he gave him horses with different temperaments, one that you could walk in and lift your hand and the horse just did it itself, and another that you really had to work through to get that pose. And Ross watched videos of himself and we'd critique him." It all paid off one year at the Minnesota Fall Festival, when it suddenly became apparent that Ross had developed into an amateur handler of uncommon potential. "I'm not sure what year it was," Terri says, "but he was with a horse he was showing as an amateur for a client of the Schalls. They told him just to go out there and do his best, and it was a big class. He ended up reserve -- but it was like he and the horse just clicked. There was a definite look of 'I can do it now.'" And "do it" he did. In 1999, Ross Danielson won his first U.S. National Championship in Amateur Mares with RGR Kkissandra, then returned the next year to win the title with Kourisma, the only amateur ever to win back-to-back titles. The following year, unable to find just the right mare to show, he came back with the gelding Hooray Kouvay, and won Top Tens in amateur at Scottsdale and the Canadian and U.S. Nationals. 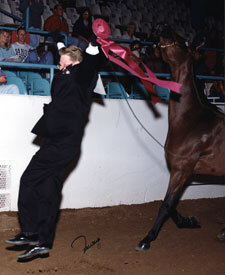 In 2002, he collected amateur National top tens with the mare CJ Psymphony. TR Psatin Kkisses added another Canadian National Champion Mare AAOTH title in 2003, and this year, HC Magnifico Miss will be his partner in the quest for the crown. 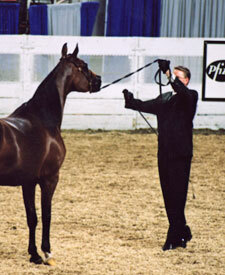 Enhancing the mares' reputation has been the fact that while Ross shows them amateur, Jerry or Jeff Schall often accompanies them in open competition. Terri Danielson is quick to credit the Schalls' contribution to Danielson Arabians both in the show ring and, before that, in the critical selection of bloodstock. "We rely a lot on Jeff and Jerry," she observes. "I don't think our program would be where it is today without them." 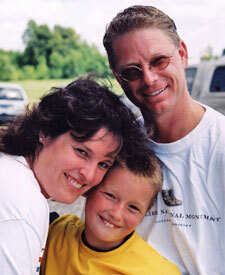 From the beginning, Terri and Ross were conservative with their facility. The entire operation was run out of a comfortable eight-stall barn -- not a showplace, but just a good, working stable. Their 274 acres of land was (and still is) surrounded by property owned by Terri's mother, father and brother. It provided an idyllic and safe place for their son Jonathan to grow up, and their horses were accommodated, but as far as their Arabian business went, it was "private." However, both Ross and Terri are in real estate and property development, and over the years, certain investments worked out in such a way that they were able to build the facility of their dreams. Even so, they kept it sane; the purpose was to accommodate their Arabian operation and be income-producing as well. Last year their private farm very definitely went public. "We've got 49 stalls in the big barn, we've got eight stalls in the little barn," Ross recounts. "And an indoor arena, an office that has trophy cases, a viewing window into an arena, a big lounge area with rock fireplace, a full bathroom, wash facilities, laundry, and a shower. The hot water is heated, and there are two wash racks, a groom area, a tack area, and four foaling pens with satellite cameras on them. We can monitor from anyplace; the satellite camera is in the lounge area, and we can take it with us wherever we go." He laughs and adds, "If we connect to the Internet, we can see what is going on even if we're in Louisville or Albuquerque or wherever. We can just plug into the computer system and check out what's going on at home." Turnout paddocks offer fresh air and exercise for residents, and indoors, fresh air is not a problem. 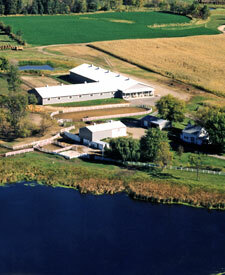 One of their biggest projects was constructing the barn in such a way that circulation is excellent. "The concept is maximum air flow," Ross says. "Fresh air from cupolas on the roofline is brought down. And our barn is set up to be east and west and north and south, so it is kind of an L-shape. The east and west side is where the stalls are. Because east and west is where your air flows the best, we have screen doors on the outside of the barn. 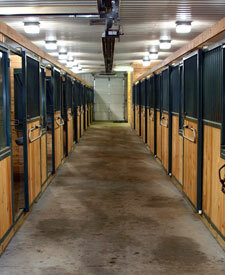 Then we have a 16-foot wide screen door, which allows the air to flow all the way through the barn and the arena. The arena sets north and south, so you don't get the air flow, but it gives you the shade and comfort and coolness that you need there"
How did they figure out to do that? "Ask a bunch of old dairy farmers and they will tell you," he says with a chuckle. "They go out in the middle of the night to line up barns and sheds and so forth with the north star." It took them more than a year -- and a lot of visiting to other facilities -- to design and position their barn, but they feel it was worth it. "We were looking at what worked and what didn't," Ross explains. "For instance, our barn has radiant heat. Most barns have forced air heat, but that's a very dangerous heat because you get dust that builds up in the heater and can cause a fire. Radiant heat is a consistent heat that heats the object, which then radiates the heat into the air. So if dust settles down on to your radiator, it just is melted away. It doesn't cause a fire. It's the safest heat you can have in a barn." The facility is now filled with a variety of customers. Bob Boggs leases stalls, but not everyone there is an Arabian owner, and not everyone shows. "Some just want to come out and spend a day with their horse and break away from reality," Ross relates. "Some are in dressage, some go to local shows. Some show competitively and come there just to condition or train horses. There's no training except what people do themselves, but we have boys who do conditioning and so forth to make the horses look good and presentable." It's a relaxed and pleasant atmosphere. Do they want to get any bigger? "This is it," Ross says. "This is plenty." "It's taken a long time to get to where we've gotten," Ross reflects. "It took a National champion mare." He doesn't say it in so many words, but it also took his getting good enough to take a mare they'd chosen all the way to the championship. Participation is essential in their view of the Arabian world. "If I'm not going to get out there and show my own horses, then I don't feel the horse needs to go to a show." That's part of the fun, he stresses. Breed the horses, show the horses, do it all. This is a business for them -- there is no question about that. But it is also their favorite thing to do. "I truly love what we're doing," he says. "At Fall Fest last year, I was high-point amateur and they gave me a big presentation on that. We found out that we have some horses who've gotten their Legion of Honor and we'd never realized it. And there are some truly great people out in the horse business -- there're some shysters too, but there are some truly great people that you can really appreciate." At the present, it appears that for Danielson Arabians, the future includes just doing more of what they are doing well. But there might be a few innovations on the horizon. Right now, only their son Jonathan is showing in the performance ranks, and Terri, who was a western pleasure champion in years gone by, predicts that if he keeps it up, they will have to get him mounted on a horse with National potential. "We've got one who will make a beautiful western pleasure horse," she smiles, noting that Ross started playing around with TR Copperclassique this year. "My husband just does it for fun, but she was nine times undefeated at all the shows around here. She is really, really a beautiful horse." They are intrigued with what a professional trainer might be able to do with "Dilly Filly." As they have all along, they are proceeding cautiously. If Jonathan Danielson decides to continue his western pleasure career, he may add an entirely new facet to Danielson Arabians. In the meantime, his parents are content to fine-tune a program that has given them national stature in the Arabian business. 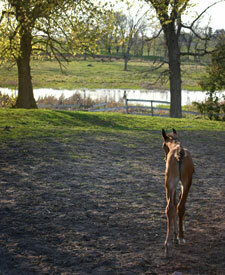 With their foal crop more than doubling now (from two to five), they look forward to an expanded marketplace.